A small child walking with his father goes on inquiring constantly. He asks his father so many odd things, and the father has to satisfy him with proper answers. When I was a young father in my householder life, I was overflooded with hundreds of questions from my second son, who was my constant companion. One day it so happened that a bridegroom’s party was passing our tram-car, and the four-year-old boy, as usual, inquired what the big procession was. He was given all possible answers to his thousand and one questions regarding the marriage party, and finally he asked whether his own father was married! This question gave rise to loud laughter from all the elderly gentlemen present, although the boy was perplexed as to why we were laughing. Anyway, the boy was somehow satisfied by his married father. The lesson from this incident is that since a human being is a rational animal, he is born to make inquiries. The greater the number of questions, the greater the advancement of knowledge and science. The whole of material civilization is based on this originally large volume of questions put by young men to their elders. When elderly persons give the proper answers to the questions of the youngsters, civilization makes progress, one step after another. The most intelligent man, however, inquires about what happens after death. The less intelligent make lesser inquiries, but the questions of those who are more intelligent go higher and still higher. Among the most intelligent of men was Maharaja Pariksit, the great king of the entire world, who was accidentally cursed by a brahmana to meet death from the bite of a serpent within seven days. The brahmana who cursed him was only a boy, yet he was very powerful, and because he did not know the importance of the great king, the boy foolishly cursed him to meet death within seven days. This was later lamented by the boy’s father, whom the king had offended. When the king was informed of the unfortunate curse, he at once left his palatial home and went to the bank of the Ganges, which was near his capital, to prepare for his impending death. Because he was a great king, almost all the great sages and learned scholars assembled at the place where the king was fasting prior to leaving his mortal body. At last, Sukadeva Gosvami, the youngest contemporary saint, also arrived there, and he was unanimously accepted to preside at that meeting, although his great father was also present. The king respectfully offered Sukadeva Gosvami the principal seat of esteem and asked him relevant questions regarding his passing from the mortal world, which was to take place on the seventh day thenceforward. The great king, as a worthy descendant of the Pandavas, who were all great devotees of the Lord, placed the following relevant inquiries before the great sage Sukadeva. The great sage, having thus been pleasingly requested by the king, answered his questions authoritatively, for the sage was a great transcendental scholar and was also well equipped with godly qualities, since he was the worthy son of Badarayana, or Vyasadeva, the original compiler of the Vedic literature. The Srimad-Bhagavatam is the natural commentary upon the great Vedanta- (or Sariraka-) sutras, which were compiled by Srila Vyasadeva. The Vedanta-sutras are the topmost Vedic literature, and they contain the nucleus of basic inquiries about the transcendental subject of spiritual knowledge. Yet although Srila Vyasadeva compiled this great treatise, his mind was not satisfied. Then he happened to meet Sri Narada, his spiritual master, who advised him to describe the identity of the Personality of Godhead. 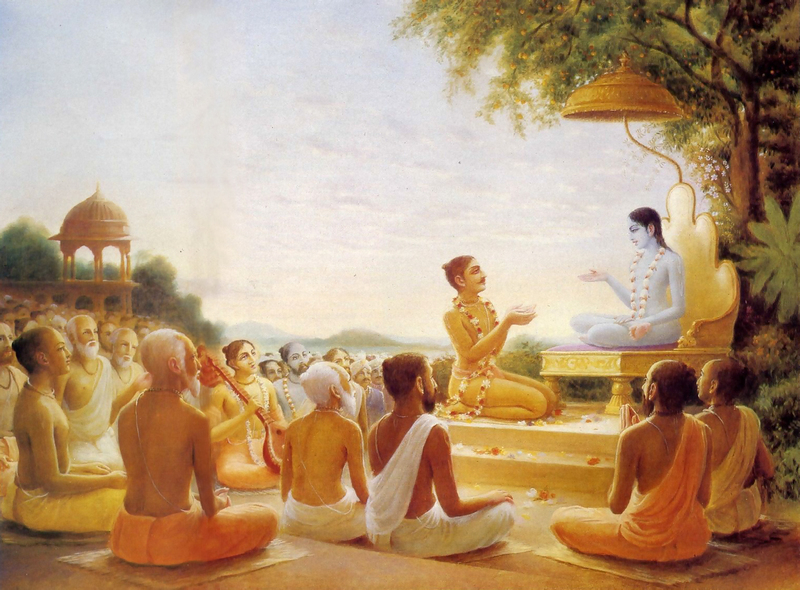 Upon receiving this advice, Vyasadeva meditated on the principle of bhakti-yoga, which showed him distinctly what is the Absolute and what is the relativity, or maya. Having achieved perfect realization of these facts, he compiled the great narration of the Srimad-Bhagavatam, or beautiful Bhagavatam, which begins with actual historical facts concerning the life of Maharaja Pariksit. As long as a man is in the full vigor of life, he forgets the naked truth of death, which he has to meet. Thus a foolish man makes no relevant inquiry about the real problems of life. Everyone thinks that he will never die, although he sees evidence of death before his eyes at every second. Here is the distinction between animalism and humanity. An animal like a goat has no sense of its impending death. Although its brother goat is being slaughtered, the goat, being allured by the green grass offered to it, will stand peacefully waiting to be slaughtered next. On the other hand, if a human being sees his fellow man being killed by an enemy, he either fights to save his brother or leaves, if possible, to save his own life. That is the difference between a man and a goat. An intelligent man knows that death is born along with his own birth. He knows that he is dying at every second and that the final touch will be given as soon as his term of life is finished. He therefore prepares himself for the next life or for liberation from the disease of repeated birth and death. A foolish man, however, does not know that this human form of life is obtained after a series of births and deaths imposed in the past by the laws of nature. He does not know that a living entity is an eternal being, who has no birth and death. Birth, death, old age, and disease are external impositions on a living entity and are due to his contact with material nature and to his forgetfulness of his eternal, godly nature and qualitative oneness with the Absolute Whole. Human life provides the opportunity to know this eternal fact, or truth. Thus the very beginning of the Vedanta-sutra advises that because we have achieved this valuable form of human life, it is our duty—now—to inquire, What is Brahman, the Absolute Truth? A man who is not intelligent enough does not inquire about this transcendental life; instead, he inquires about many irrelevant matters that do not concern his eternal existence. From the very beginning of his life, he inquires from his mother, father, teachers, professors, books, and so many other sources, but he does not have the right type of information about his real life. As mentioned before, Pariksit Maharaja was given a warning notice that he would meet death within seven days, and he at once left his palace to prepare himself for the next stage. The king had at least seven days at his disposal in which to prepare for death, but as far as we are concerned, although at least we know that our death is sure, we have no information of the date fixed for the occurrence. I do not know whether I am going to meet death at the next moment. Even such a great man as Mahatma Gandhi could not calculate that he was going to meet with death in the next five minutes, nor could his great associates guess his impending death. Nonetheless, all such gentlemen present themselves as great leaders of the people. It is ignorance of death and life that distinguishes an animal from a man. A man, in the real sense of the term, inquires about himself and what he is. Wherefrom has he come into this life, and where is he going after death? Why is he put under the troubles of threefold miseries although he does not want them? Beginning from one’s childhood, one goes on inquiring about so many things in his life, but he never inquires about the real essence of life. This is animalism. There is no difference between a man and an animal as far as the four principles of animal life are concerned, for every living being exists by eating, sleeping, fearing, and mating. But only the human life is meant for relevant inquiries into the facts about eternal life and the Transcendence. Human life is therefore meant for research into eternal life, and the Vedanta-sutra advises that one should conduct this research now or never. If one fails to inquire now into these relevant matters about life, one is sure to go back again to the animal kingdom by the laws of nature. Therefore, even if a foolish man appears advanced in material science—that is, in eating, sleeping, fearing, mating, and so on—he cannot get free from the cruel hands of death by the law of nature. The law of nature works under three modes—goodness, passion, and ignorance. Those who live under conditions of goodness are promoted to the higher, spiritual status of life, and those who live under conditions of passion remain stationed in the same place in the material world where they are now, but those who live under conditions of ignorance are sure to be degraded to the lower species. The modern setup of human civilization is a risky one because it offers no education about relevant inquiries into the essential principles of life. Like animals, people do not know that they are going to be slaughtered by the laws of nature. They are satisfied with a bunch of green grass, or a so-called jolly life, like the waiting goat in a slaughterhouse. Considering such a condition of human life, we are just trying to make a humble attempt to save the human beings by the message of BACK TO GODHEAD. This method is not fictitious. 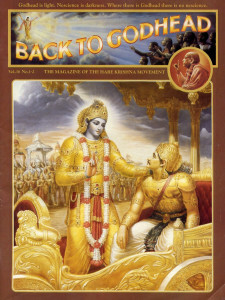 If there is at all to be an era of reality, this message of BACK TO GODHEAD is the beginning of that era. According to Sri Sukadeva Gosvami, the real fact is that a grhamedhi; or a person who has tied himself, like the goat meant for slaughter, in the business of family, society, community, nation, or humanity at large in regard to the problems and necessities of animal life—namely eating, sleeping, fearing, and mating—and who has no knowledge of the Transcendence, is no better than an animal. He may have inquired about physical, political, economic, cultural, educational, or similar other matters of temporary, material concern, but if he has not inquired about the principles of transcendental life, he should be regarded as a blind man driven ahead by uncontrolled senses and about to fall into a ditch. That is the description of the grhamedhi. The opposite of the grha-medhi; however, is the grha-stha. The grhastha-asrama, or the shelter of spiritual family life, is as good as the life of a sannyasi, a member of the renounced order. Regardless of whether one is a householder or a renunciant, the important point is that of relevant inquiries. A sannyasi is bogus if not interested in relevant inquiries, and a grhastha, or householder, is bona fide if he is inclined to put forward such inquiries. The grhamedhi, however, is simply interested in the animal necessities of life. By the laws of nature, the grhamedhi’s life is full of calamities, whereas the life of the grhastha is full of happiness. But in the modern human civilization, the grhamedhis are posing as the grhasthas. We should therefore know who is what. A grhamedhi’s life is full of vices, because he does not know how to live a family life. He does not know that beyond his control is a power who supervises and controls his activities, and he has no conception of his future life. The grhamedhi is blind to his future and has no aptitude for making relevant inquiries. His only qualification is that he is bound by the shackles of attachment to the false things he has contacted in his temporary existence. At night such grhamedhis waste their valuable time by sleeping or by satisfying their different varieties of sexual urges by visiting cinema shows and attending clubs and gambling houses, where women and liquor are indulged in lavishly. And during the day, they waste their valuable life in accumulating money or, if they have sufficient money to spend, by adjusting the comforts of their family members. Their standard of living and their personal needs increase with their increase in monetary income. Thus there is no limit to their expenses, and they are never satiated. Consequently there is unlimited competition in the field of economic development, and therefore there is no peace in any society of the human world. Everyone is perplexed by the same questions about earning and spending, but ultimately one must depend on the mercy of mother nature. When there is a scarcity in production or there are disturbances caused by providence, the poor plan-making politician blames it on cruel nature but carefully avoids studying how and by whom the laws of nature are controlled. The Bhagavad-gita, however, explains that the laws of nature are controlled by the Absolute Personality of Godhead. God alone is the controller of nature and the natural laws. Ambitious materialists sometimes examine a fragment of the law of nature, but they never care to know the maker of these laws. Most of them do not believe in the existence of an absolute person or God who controls the laws of nature. Rather, they simply concern themselves with the principles by which different elements interact, but they make no reference to the ultimate direction which makes such interactions possible. They have no relevant questions or answers in this regard. The second of the Vedanta-sutras, however, answers the essential question about Brahman by asserting that the Supreme Brahman, the Supreme Transcendence, is He from whom everything is generated. Ultimately, He is the Supreme Person. Not only is the foolish grhamedhi ignorant of the temporary nature of the particular type of body he has obtained, but he is also blind to the actual nature of what is happening before him in the daily affairs of his life. He may see his father die, his mother die, or a relative or neighbor die, yet he does not make the relevant inquiries about whether or not the other existing members of his family will die. Sometimes he thinks and knows that all the members of his family will die today or tomorrow and that he also will die. He may know that the whole family show—or, for that matter, the whole show of community, society, nation, and all such things—is but a temporary bubble in the air, having no permanent value. Yet he is mad after such temporary arrangements and does not concern himself with any relevant inquiries. He has no knowledge as to where he has to go after his death. He works very hard for the temporary arrangements of his family, society, or nation, but he never makes any future arrangement either for himself or for others who will pass from this present phase of life. In a public vehicle like a railway carriage, we meet and sit down together with some unknown friends and become members of the same vehicle for a short time, but in due course we separate, never to meet again. Similarly, in a long sojourn of life, we get a temporary sitting accommodation in a so-called family, country, or society, but when the time is up, we are unwillingly separated from one another, never to meet again. There are so many questions relevant to our temporary arrangements in life and our friends in these temporary arrangements, but a man who is a grhamedhi never inquires about things of a permanent nature. We are all busy making impermanent plans in various degrees of leadership, without knowing the permanent nature of things as they are. Sri Sukadeva Gosvami has particularly used four words in regard to the absolute Personality of Godhead. These words distinguish the Absolute Person, or Parabrahman, from other persons, who are qualitatively one with Him. The Absolute Personality of Godhead is addressed as sarvatma, or all-pervading, because no one is aloof from Him, although not everyone has this realization. The Personality of Godhead, by His plenary representation, resides in everyone’s heart as Paramatma, the Supersoul, along with each individual soul. Therefore every individual soul has an intimate relationship with Him. Forgetfulness of this eternally existing intimate relationship with Him is the cause of conditional life since time immemorial. But because He is Bhagavan, or the supreme personality, He can at once reciprocate the responsive call of a devotee. Moreover, because He is the perfect person, His beauty, opulence, fame, strength, knowledge, and renunciation are all unlimited sources of transcendental bliss for the individual soul. The individual soul becomes attracted by all these different opulences when they are imperfectly represented by other conditioned souls, but the individual soul is not satisfied by such imperfect representations, and therefore he perpetually seeks the perfect one. The Personality of Godhead’s beauty has no comparison, nor do His knowledge and renunciation. But above all, He is isvara, or the supreme controller. We are at present being controlled by the police action of this great king. This police control is imposed upon us because of our disobedience of law. But because the Lord is Hari, He is able to cause the disappearance of our conditional life by giving us full freedom in spiritual existence. It is therefore the duty of every man to make relevant inquiries about Him and thus go back to Godhead. This article first appeared in 1960, when Srila Prabhupada himself was publishing BACK TO GODHEAD in India.